That’s probably the most common question we get asked and it depends on what you are looking to do with the camera. For reference the standard GoPro lens is 2.8mm, so 3-12mm are good for wide/medium shots. 16mm – 25mm are great for closeups with soft backgrounds and longer lenses are great for zoom and telephoto. Before getting into details, first let’s look at the different lens types that the Ribcage supports without the need for an adapter. Also known as ‘S-Mount’ or ‘Board lenses’. They are lenses similar in size to the original GoPro lens. Typically these are best used for applications requiring small size and weight such as use with small drones and gimbals. This lens type typically has a fixed focus and fixed iris so they are meant to be set up once and locked in. These attach to the large mounting ring on the camera. CS-Mount was developed mostly for security applications so there are thousands of ultra sharp high megapixel lenses available at a relatively low cost. This lens type also commonly has ‘IR-Corrected’ or ‘Day&Night’ capability. That means they can focus on Infrared and visible light at the same time which a normal lens can’t. C-Mount was originally developed in the 1920’s for film cameras and has been in use ever since. These can be attached to the camera by attaching the 5mm spacer ring. There are a vast array of C-Mounts available as they were commonly used on home movie cameras in the 50’s and 60’s, security and TV cameras and now for machine vision, factory automation and inspection applications that require the highest quality optics. You can buy vintage or new! While you can connect any M12, CS or C-Mount lens, 1/2.3″, 1/2” and 2/3” lenses are best. The value in inches simply tells you the size of the image sensor the lens was originally designed for. The GoPro uses a 1/2.3″ sensor. Ribcage has a crop factor of 5.6x for 35mm SLR lenses, so wide angle lenses are generally more useful. 1/2.5” lenses are ‘technically’ slightly too small for the sensor but in most cases give complete coverage and excellent results. 1/3” or 1/4” lenses are too small for the sensor to be used in wide mode, although they can still be used with the camera’s ‘medium’ and ‘narrow’ shooting modes. Focal lengths ranging from 4mm up to 25mm will prove to be most useful for general shooting. Focal lengths under 4mm will have a similar or more pronounced fish-eye effect than the stock GoPro lens unless they are labelled ‘rectilinear’ or ‘low distortion’. If you want to use the optional night vision feature of the Ribcage, IR corrected or D&N (day & night) lenses are recommended. These lens types allow IR and visible light to be in focus at the same time. The built in M12 socket of the Ribcage will support M12 lenses with a maximum of 4.65mm back focus distance. At maximum distance the set screw may not engage. For M12 lenses requiring a longer back focal distance we offer an optional M12 to CS-Mount adapter which provides all the necessary distance required. Brands we have tested and find to be generally quite good are Computar, Kowa, Tokina, Fujinon, and Tamron. A selection of recommended lenses can be found in our shop. Below is a crop factor diagram showing the image circles projected by the most common lens types in relation to the GoPro image sensor. You may find it helpful to visualize the crop factor. Click to enlarge. 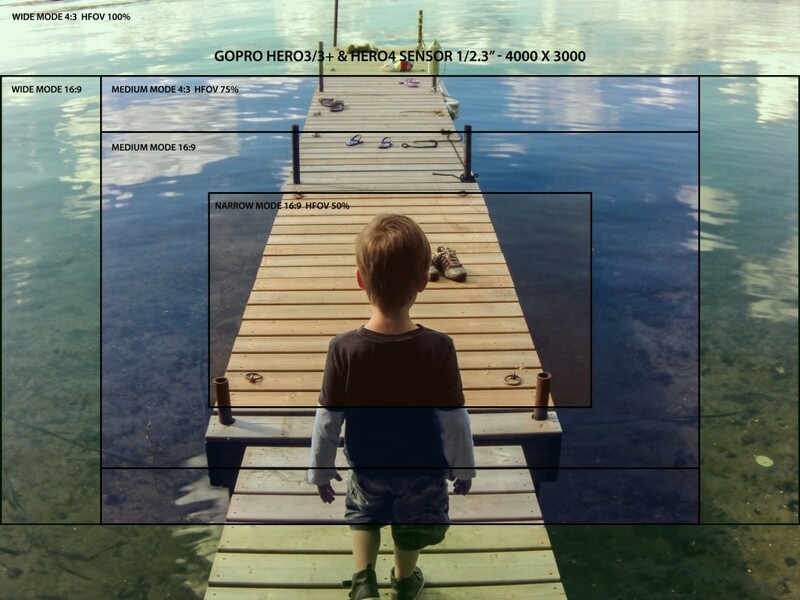 This image shows the sensor area used by GoPro’s different shooting modes. Medium mode gives you 75% field of view and Narrow mode will give you 50% field of view relative to the full sensor. These modes can be quite handy if you are using a lens smaller than the recommended 1/2.3″. You can also get more magnification from a wide angle lens if you need to.